Tender cuts of beef simmered in a thick, savory sauce. 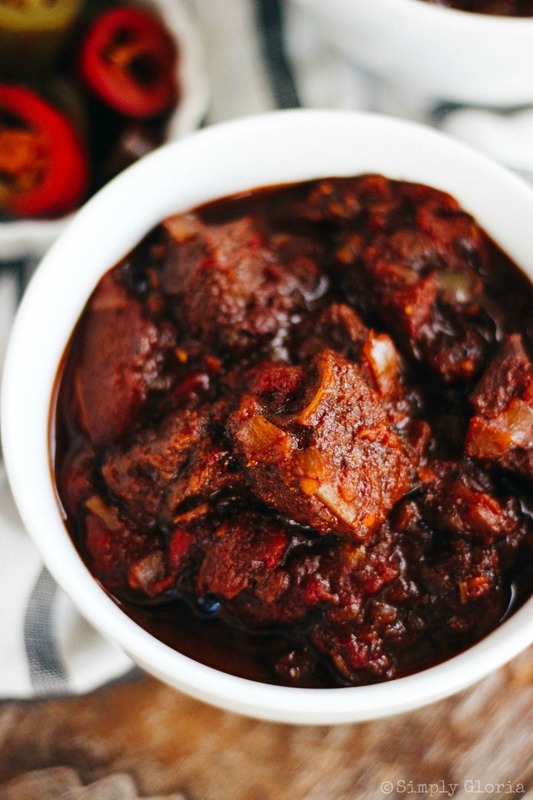 This hearty and satisfying Chunky Beef Chili has immense flavor and texture to pack a punch! This is a chili you’ll fall in love with. You know how I know this? Because all my guys have THE most pickiest of the pickiest taste buds. Trying to please all of them with one chili recipe is challenging. And, this chili recipe delivers to all kinds of picky taste buds! The full recipe of this (mouth-watering, saporous, enticing, and tasty!) Chunky Beef Chili is down below. But first, I want to show you how simple this is to throw together in a heavy pot or Dutch oven. 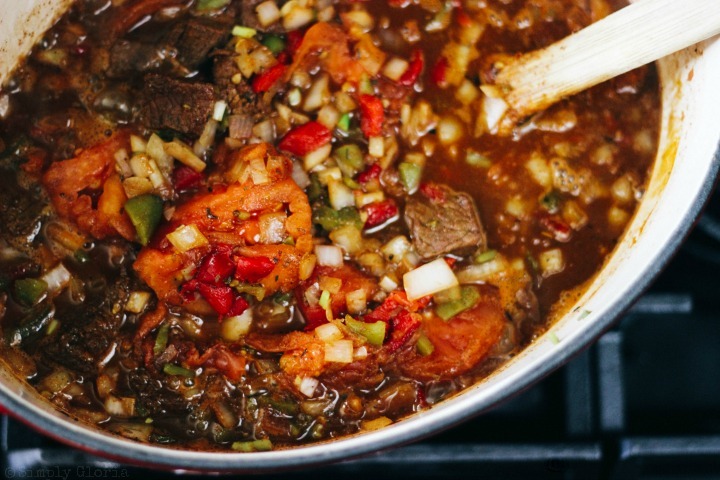 You do need to plan on this chili taking 3-4 hours to simmer… that’s SIMMER to perfection. While slow cooking it on the stove top, without the lid, allows the succulent sauce to thicken (without any thickening agents, by the way) and cook into the beef, making the beef tender and melt in your mouth. 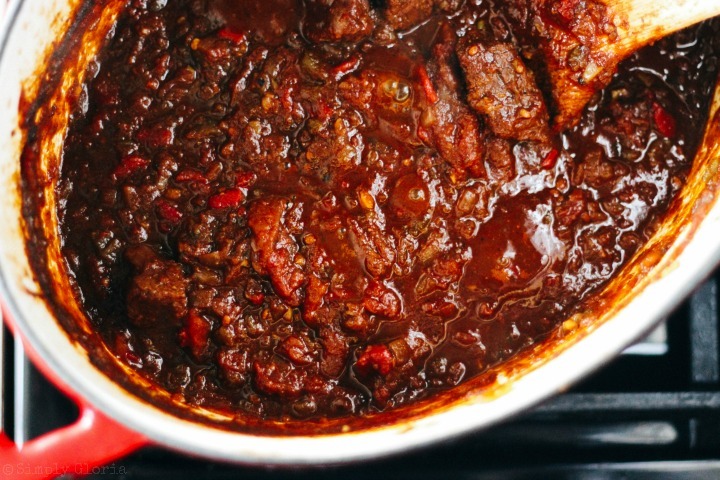 Searing the beef first adds a whole other layer of flavor to this chili. I love to use fresh ripened tomatoes in this chili recipe, just by blanching the tomatoes in boiling water. (Set the washed tomatoes in boiling water for 1-2 minutes. Take out and immediately chill the tomatoes in ice water and peel the skin. Cut and put in the chili.) But obviously, if fresh tomatoes are not in season, go to the next best thing– tomatoes in the can! Roasted Anaheim and red bell peppers add another depth to the chili, too! But again, the veggies in the can (or jar) are a great substitute and sometimes less expensive than the fresh produce! Chop the vegetables and stir them in with the browned beef. Stir and let this baby simmer! Since this is cooking on the stove top for those few hours, keep going over to check on your simmer. Be sure to give it a few stirs every hour. You may also want to turn it down from medium to low (heat) the closer it gets to being done. Because the sauce will have begun to thicken and you don’t want it to spurt all over and stick to the bottom of your pot or Dutch oven. 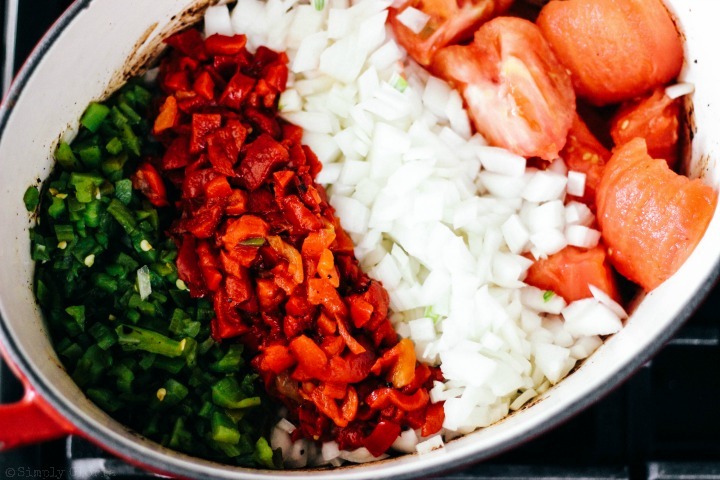 Look how all the vegetables and broth have simmered together into a delicious pot of chili! 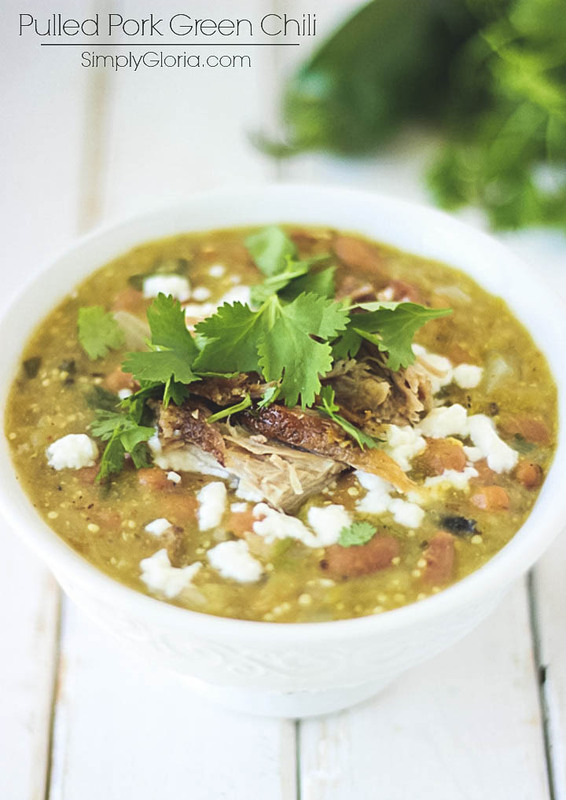 OR how about a GREEN chili– with pulled pork! As promised, down below is this hearty Chunky Beef Chili recipe that will turn your non-chili eaters to chili lovers. It’s definitely a chili the whole family will love! Go ahead and also add your favorite toppings in your bowl to customize your taste (and heat!) to another level! My personal fave… jalapenos. And, a lot of them! What are your favorite chili bowl toppings? Tender cuts of beef simmered in a thick, savory sauce. 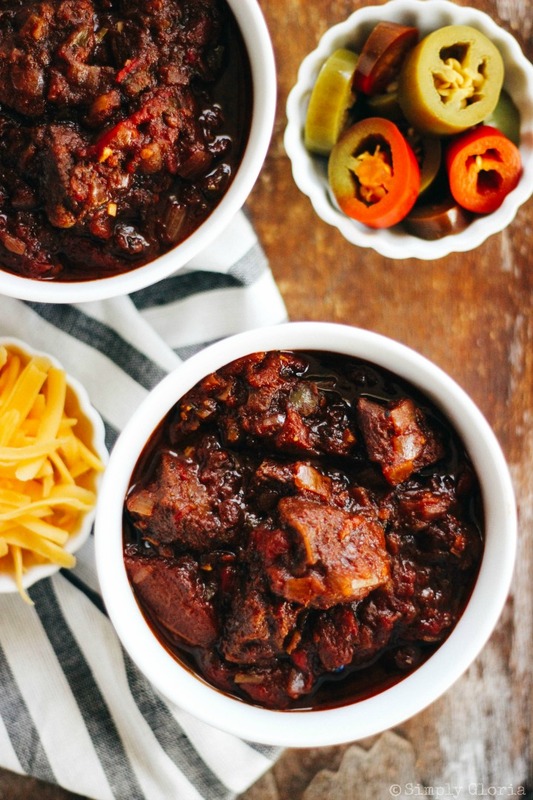 This hearty and satisfying Chunky Beef Chili has immense flavor and texture to pack a punch! It will turn your non-chili eaters to chili lovers. It’s definitely a chili the whole family will love! Cut the trimmed beef roast into 1 inch pieces and place in a large container or plastic bag. 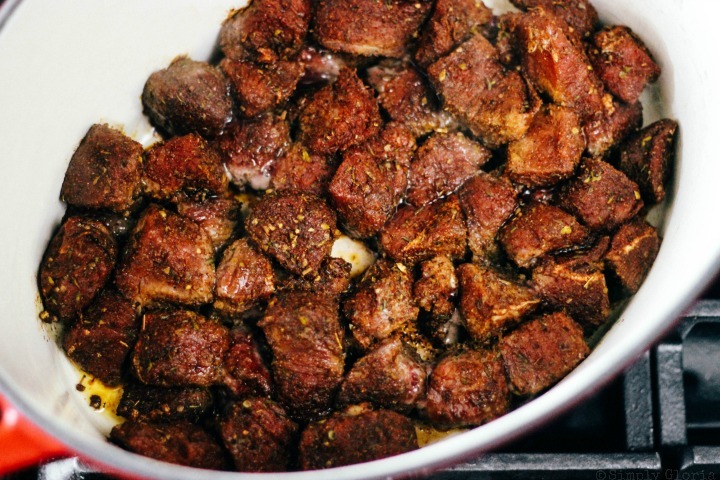 Toss the meat with chili powder, cumin, oregano, paprika, onion powder, garlic powder, pepper and Worcestershire sauce. Set aside while you chop (and roast, optional) the vegetables. 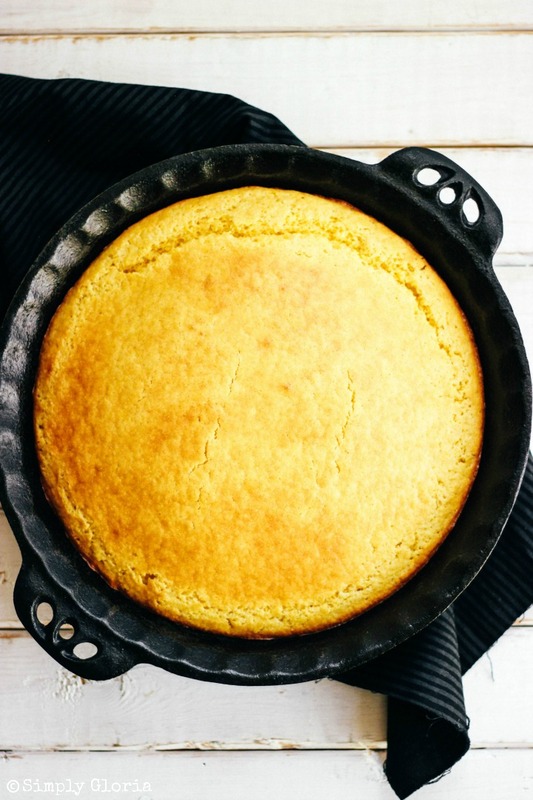 In a large heavy pan or Dutch oven, on medium heat, add olive oil to the pan and brown the seasoned meat until all sides are a brown color crust. 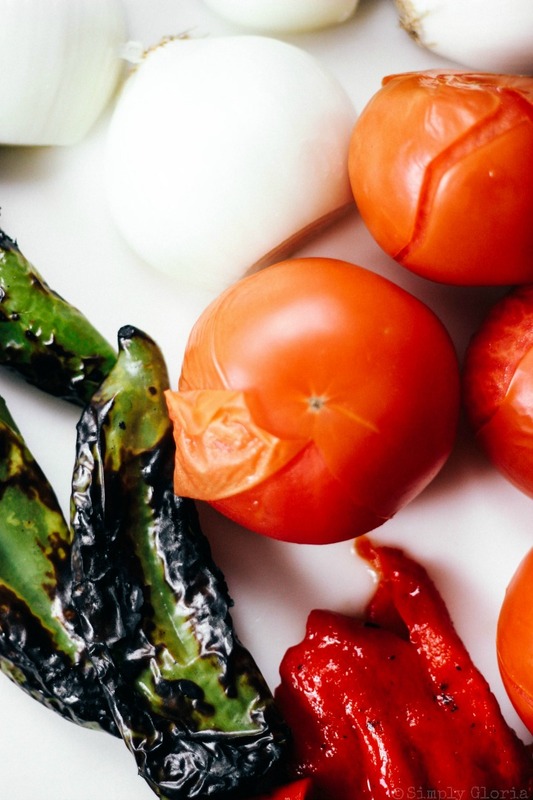 Add chopped onions, green chiles, red peppers and tomatoes to the browned meat. Pour over the beef broth and stir. Allow it to come up to a high simmer on medium heat and then turn down the heat to medium-low to low. (Depending upon your heavy pan and/or your burner temperature.) Simmer with NO lid and stir throughout the simmering process for up to 4 hours. The chopped vegetables and broth will cook down and thicken... all while making the chunks of beef super tender! Add your favorite toppings to your chili bowl to customize your taste (and heat!) to another level! 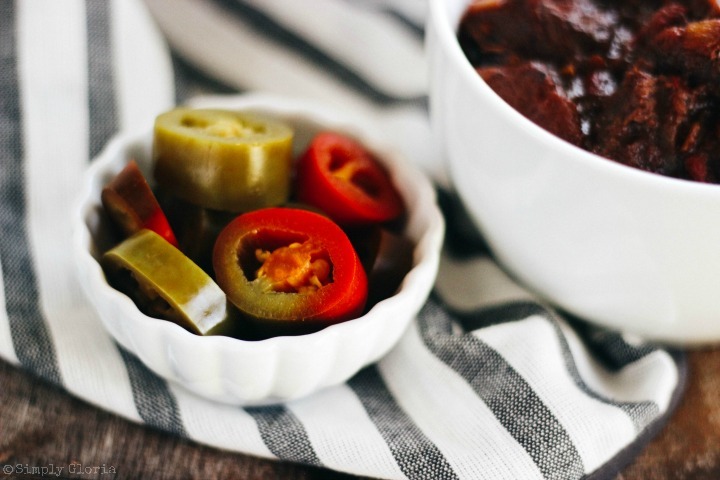 Psss… I’m sharing my Chunky Beef Chili recipe with these link parties… come join me! Sounds s delicious. Thank you, Gloria, and have a good weekend. This looks great! I bet the fresh tomatoes and the seared beef give it so much flavor. Maybe my entire crew of boys would approve as well?! What a great combination of flavors and textures! I’m going to have to keep this one for when the cool weather hits. Thanks so much for linking up with us at You Link It We Make It! This looks so amazing! I’ve never had this style of chili before, usually just ground beef style or beans. Need to try this! Morgan @ Morgan Manages Mommyhood recently posted…Best of the Weekend: Snack-Gate and the Zoo! 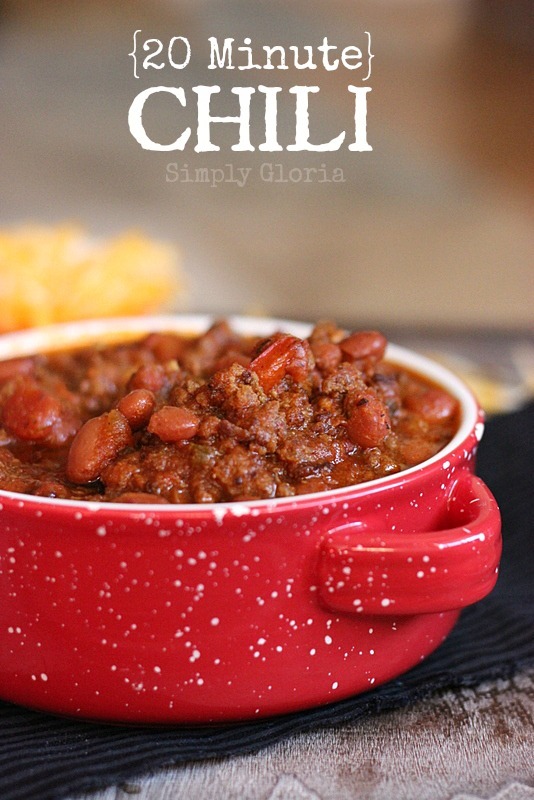 This chunky chili sounds wonderful, I would like it with a nice dollop of sour cream on top! Thanks for sharing at What’d You Do This Weekend?! Wow, your pictures looks as amazing as I’m sure this chili tastes! Pinning your recipe to try. We appreciate you linking up and sharing with us for Snickerdoodle Sunday! Have a great week ahead! Oh wow Gloria, that looks amazing! My chili loving family would love this. I’m going to pin to make soon. So glad you linked up at You Link It, We Make It! Hope to see you back tomorrow! 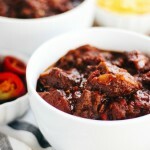 My husband is a huge fan of chili and I am sure he would love this chunky beef chili. Pinning! Thanks for sharing with us at Sweet Inspiration party. Have a wonderful week! This looks delicious! My husband would love it!! Holy crap – THIS LOOKS ABSOLUTELY AMAZING!!! This looks fantastic I can’t wait to try! Its cooling off here in Minnesota so I am going to make it this week. I just love making chillis, but I have never tried beef before. Hoping for a new taste adventure! I’m making mine with extra peppers as I like mine spicy. Thank you for sharing such an amazing recipe, Gloria. My mouth is watering just by the pictures! The chunk beef looks succulent and tender, as if they would melt in my mouth. Coming from a Vietnam I love spicy chilli food. I am also low carb so this is a perfect dish for me. As a working mother and wife, who also happens to be the maid (yes, I said it), quality meals sometimes take a back burner because I simply do not have the time for it. But with nutritious and equally delicious meals such as the chunky beef chili, that has changed. 20 mins cook time? 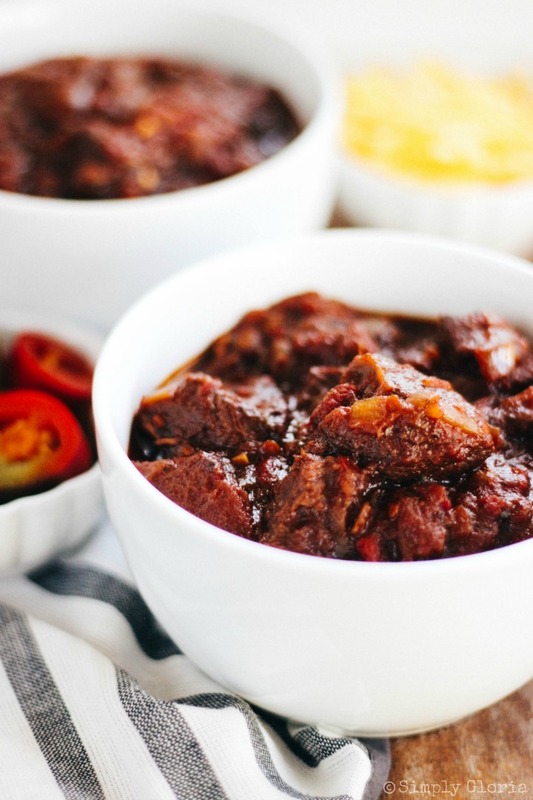 Meaty and delicious stew? A kick of spice? Count me in. My family thanks the makers of this recipe.